Coolah to Arglen via Pandoras Pass, and swinging ridges rd, I havnt done Swinging Ridges Road yet(Hopefully this weekend), but I'm told its a hoot. could be a good loop for "The mapand beer " ride, as long as its late May. I look at this route occasionally and think 'must do that !'. 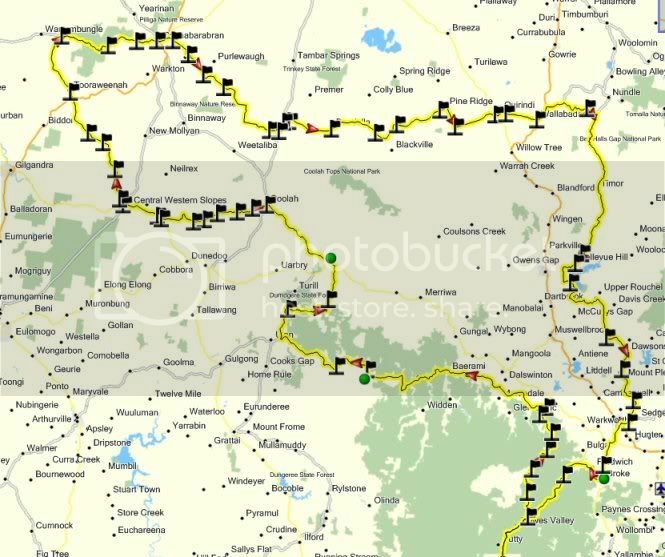 In the interests of making it happen, would anyone be keen to put Marc's GPS route to the test in early November ? How much leave do you have Whitey! Anyway, I'm interested and I haven't even looked at the proposed route yet. October is all booked out for me. We're livin' the dream mudrat ! Most of October is all booked out for me. We're livin' the dream mudrat ! Uncle Dave wrote: How much leave do you have Whitey! It's only one day off work mate. C'mon, you know you want to. Did I mention that I'm up for 3 months Long Service leave in June 2011. Haha, you're kidding! What plans you have aye?